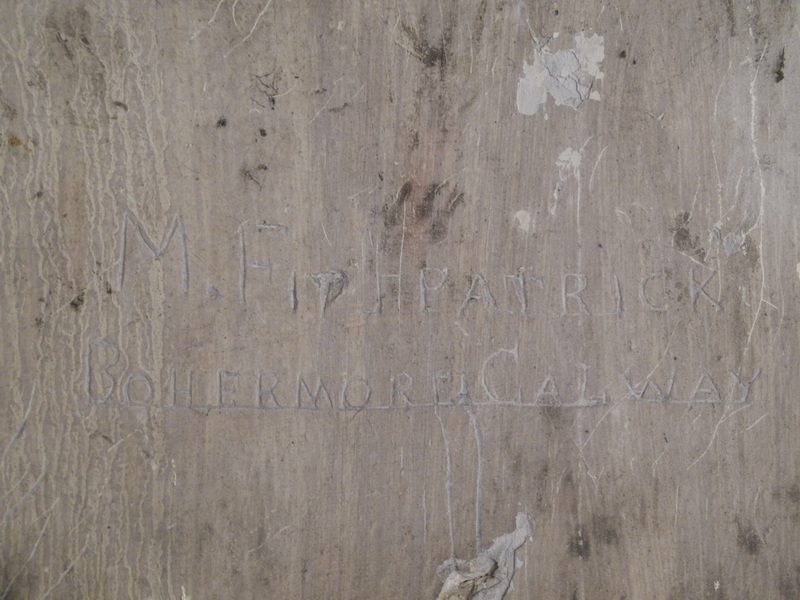 One of the issues I confronted very early in the graffiti recording process at Kilmainham Gaol was having to constantly reassess what I considered ‘graffiti’ to be, or not to be. The academic literature on the subject varies considerably and can interpret graffiti very broadly – including extrapolating methodologies and theories from prehistoric rock art as a comparative to more contemporary graffiti – to extremely narrow sociological-based definitions. The latter has been referenced by Jeff Oliver and Tim Neal in the introduction to their excellent volume Wild Signs who note the claim that graffiti originated as a response to economic downturns in the NYC/Philadelphia areas of the US in the 1970s (2010: 1). Whilst these huge variations in interpretation reveal different interpretations of the link between context, intention and form materialized in ‘graffiti’ few of the definitions engage with the materiality of graffiti: what does graffiti look like? Trying to identify graffiti may sound obvious and belonging to the realm of ‘common sense’ but attempting to interpret the link between intention and form can be problematic. This is especially the case in exploring graffiti in more historical contexts and involving interim periods of abandonment. 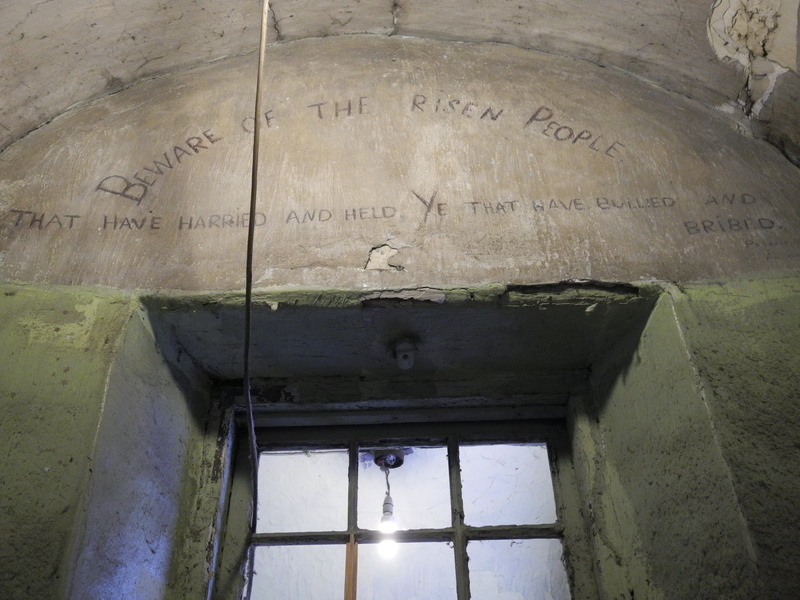 In the case of the West Wing of Kilmainham Gaol we know from Prison Board records that the last ‘great whitewash’ of the gaol was on 18 September 1922. On this occasion a number of male ‘criminal’ prisoners were brought from Mountjoy as: ‘pictures of all sorts and scribbling appeared on the walls of the cells all of which it would be well to obliterate before the prison is again used (by the women) it would be a great improvement if it could be whitewashed’. 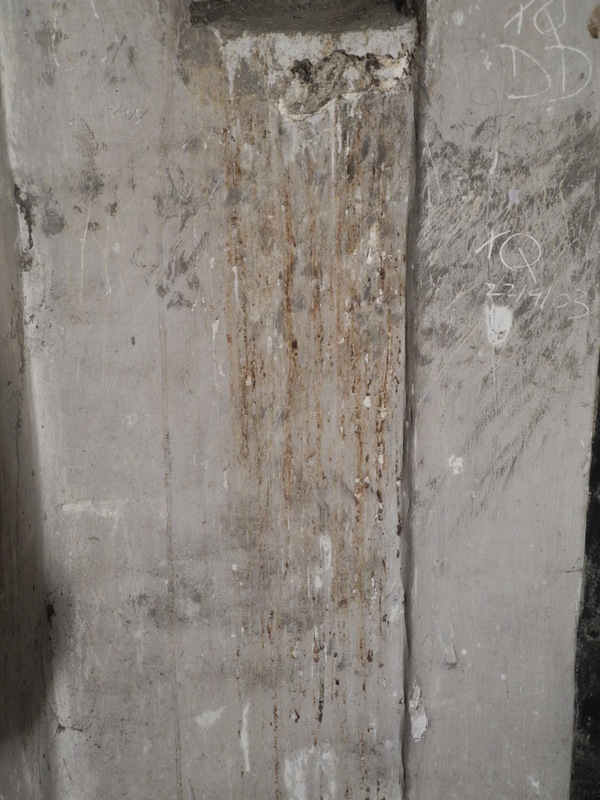 However, on embarking on recording prison graffiti nearly 100 years after this decision to cover existing graffiti the impacts of time, decay, water infiltration and haphazard whitewashing means that many partial remnants are retrievable with even rudimentary technology. Moving around Kilmainham Gaol with a digital camera, two stands and two electric lights a whole array of partial portraits, pieces of text, numbers, calendars and even maps appear. Whilst these pieces of intentionally covered graffiti raises the questions of how far we should try to retrieve these layers of graffiti and how partial can they be and still be recorded? Should we be noting what we can see or what we are meant to see? How partial should these retrievals be and still be considered graffiti? Are remnants of paint or glue used to create picture frames or attach paper postcards to cell walls graffiti? Conversely what do we do about pieces of graffiti that were engraved and thereby reveal, at least partially, their form through whitewash? After many attempts to record various forms of graffiti I noted that lightly engraved, large forms were the hardest pieces of graffiti to faithfully record using lighting and a digital camera. If we can see it but can’t record it should it still be included as part of the project? Large engraving of a full length side profile portrait of a soldier. Face depicted. As I moved across the initial cells I was recording I was moved to make the decision to broaden my definitions of graffiti to include any graffiti remnants, regardless of how partial, that could be recorded photographically (even if this took various photographs to piece together) and any piece of graffiti there was any possibility it was deliberately created. The longer I work at Kilmainham Gaol the thinner line appears between an accidental indentation created on a wall and a deliberately engraved line. It can be very difficult to define intention or interpret partial remnants but with time, experience and increasing accumulations of data hopefully I’m getting closer to understanding what is being deliberately created and what we can retrieve from it. 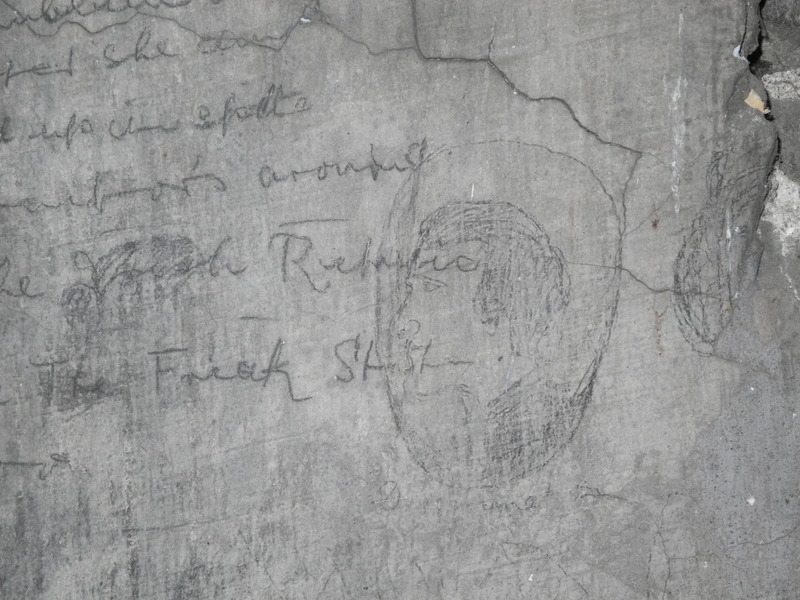 Whilst the majority of the time spent recording graffiti on this project has concentrated on examining the cells where prisoners were held it is also important to remember that graffiti exists throughout the prison. One must remember that the corridors, stairwells and basements were utilised to record messages, place drawings and scratch names, dates and addresses as well as within the individual cells. 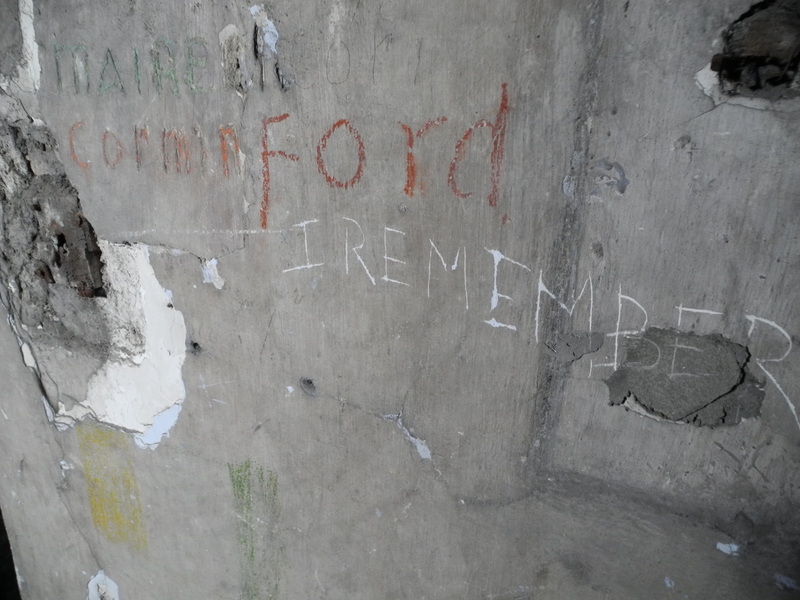 Whilst this movement from graffiting personal spaces of imprisonment to leaving marks on interconnecting, communal and even forbidden areas may reflect different uses of graffiti it is known from firsthand accounts that political prisoners held in the latter periods of Kilmainham’s usage had the ability to move throughout much of the prison wing with little intervention and control by the prison authorities. Frr movement throughout the wings is clearly demonstrated in the graffiti as one notes the range, extent and location of prisoner interactions throughout the West Wing corridors. The graffiti on display reveals a number of motivations and uses. Often, it was placed to be read by prison officers as well as prisoners. 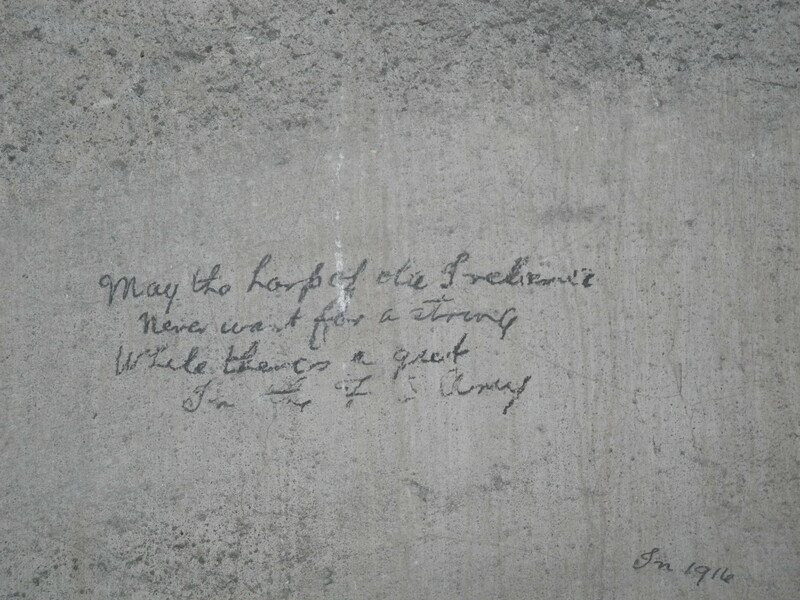 This includes a large, painted quotation by Padraig Pearse that was placed above a doorway leading into the so-called ‘1916 Corridor’ (and which is noted on many guided tours of the prison today) as well as verses that taunt the ‘Free State’ forces for their cowardice and lack of steadfastness. 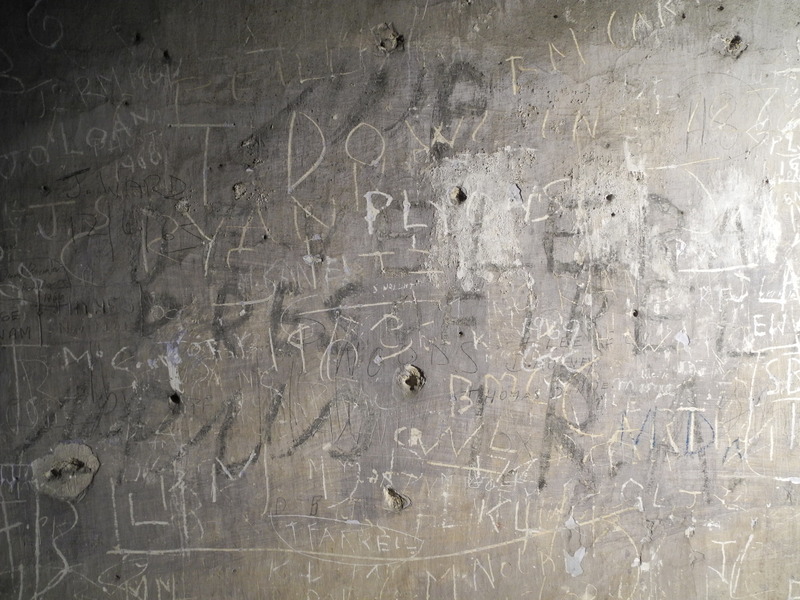 Also evidenced above many of the cell doorways in the corridor are names that the cells were given by prisoners. These can be difficult to read as they have been affected by abandonment, deliberate destruction and/or restoration but often – like the description of ‘Nurse E Grace’ (above) as being a Tipperary native – they reference locations. 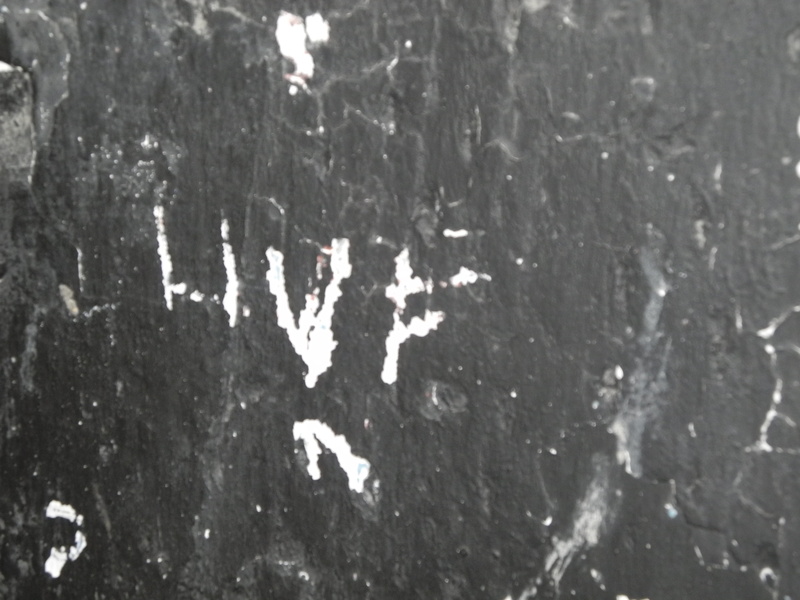 This theme of connecting to home – both outside of prison and in the friends formed whilst imprisoned – is strongly present throughout the site in graffiti. 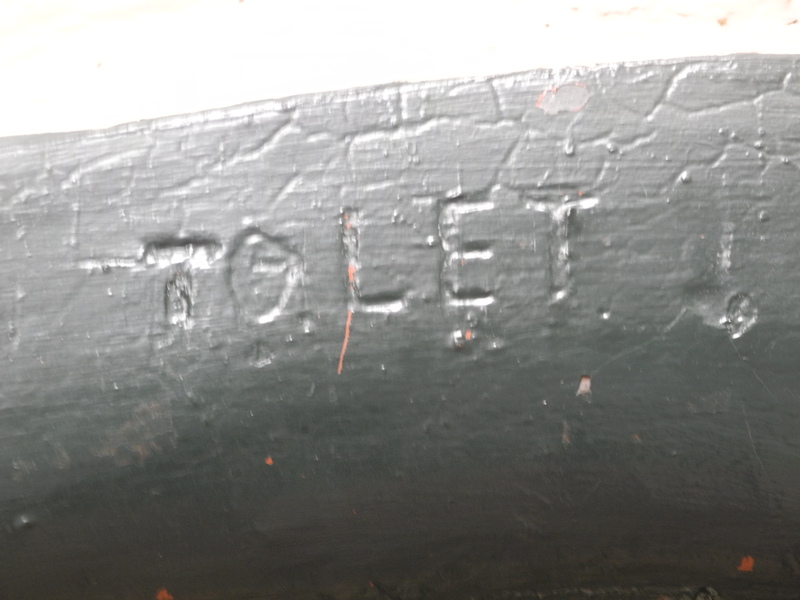 In previous posts it has been mentioned that the most numerous graffiti form is the signature and (often detailed) home address. The most frequent graffiti form found around cell doors in the West Wing corridors are placenames and collective identities based on place. 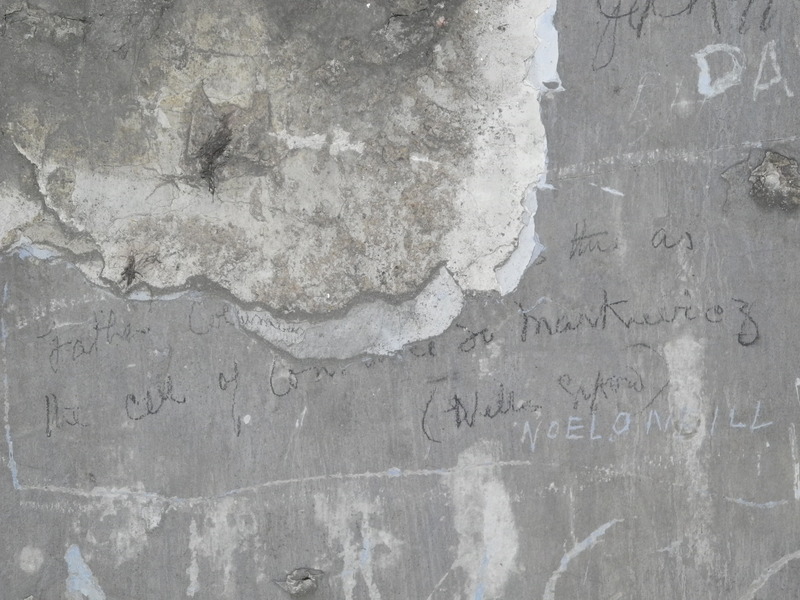 This graffiti links to the highly local nature of guerilla warfare from the War of Independence (1919-1921) onwards and how this continues to be a factor on the choice of companion and cell mate of the soldiers and their supporters during imprisonment. 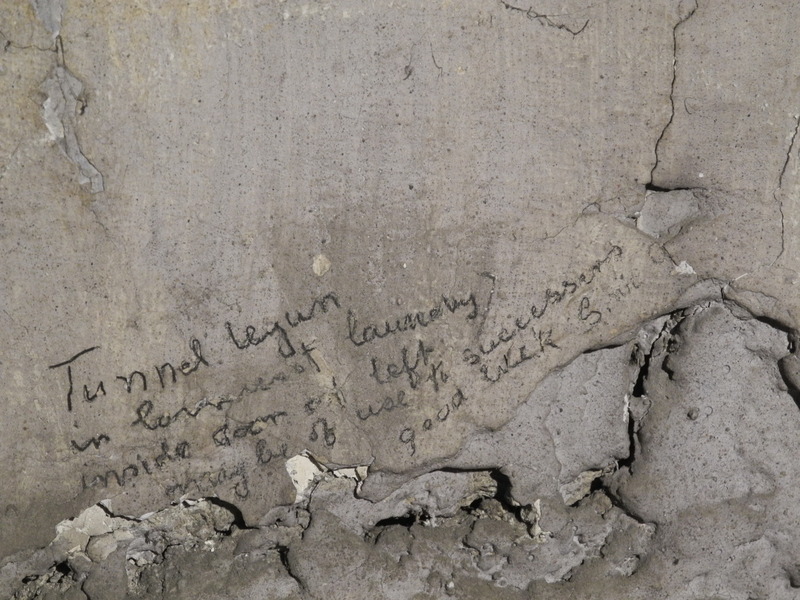 This continual link to external geography and shaming of Free State prison personnel that the graffiti of the corridors provides is potentially very important in interpreting the use of the site during its final years. It provides evidence of how the prison wing is being used to relocate the continuing struggles of comrades at ‘home’ from beyond the prison to within its confines and continuing the battles for hearts and minds despite the limitations of imprisonment. When does historic graffiti become ‘modern intrusions’? I recently moved from the relatively reified sanctuary of the top floor of the West Wing of Kilmainham Gaol to its more rough-n-ready near relation on the ground floor. This area of the prison is open to the public but the bottom of three corridors – where I am currently based – is relatively untroubled by guided tours as the majority spend their time on the hallowed first floor corridor of the ‘1916 landing’ (where many of the executed leaders of the Easter Rising spent their last days). The doors of the prison cells are now permanently locked (as they are on the above landing) but this is a recent introduction and the cells have ‘suffered’ from many ‘modern intrusions’ on top of the types of graffiti associated with imprisonment that I was used to seeing on the top floor. 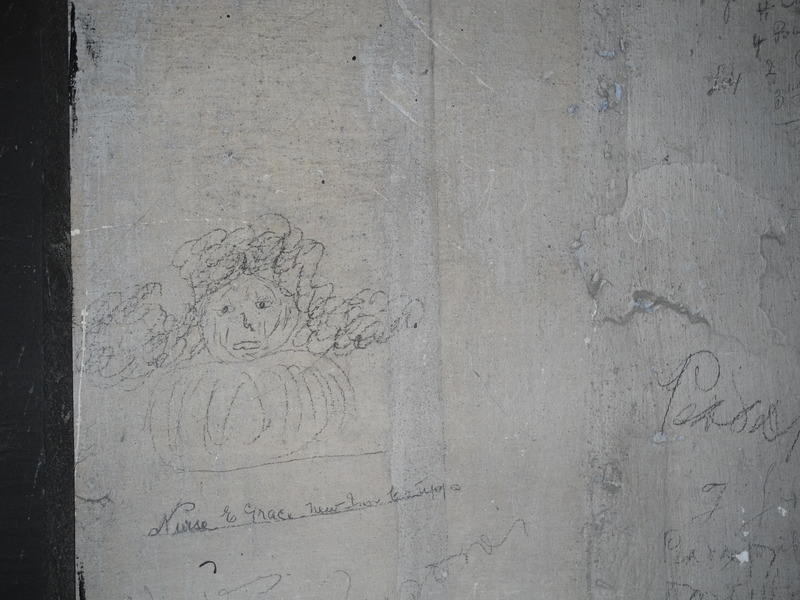 My previous experiences of recording graffiti on the top floor treated later graffiti as welcome additions – they were generally dating from the 1930s-1960s and provided evidence that ex-prisoners had returned to visit the site in its state of dereliction. 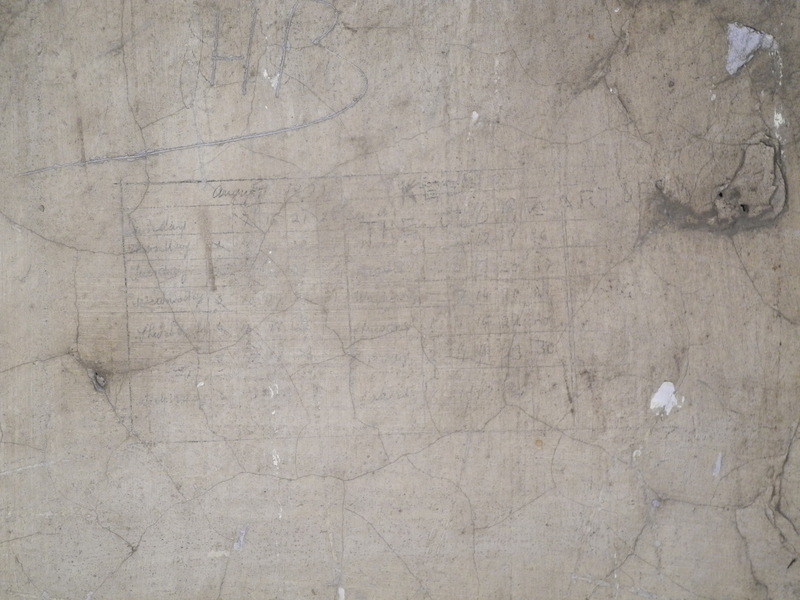 These visitors often added their names, dates of visit and even details of their original imprisonment to the walls. 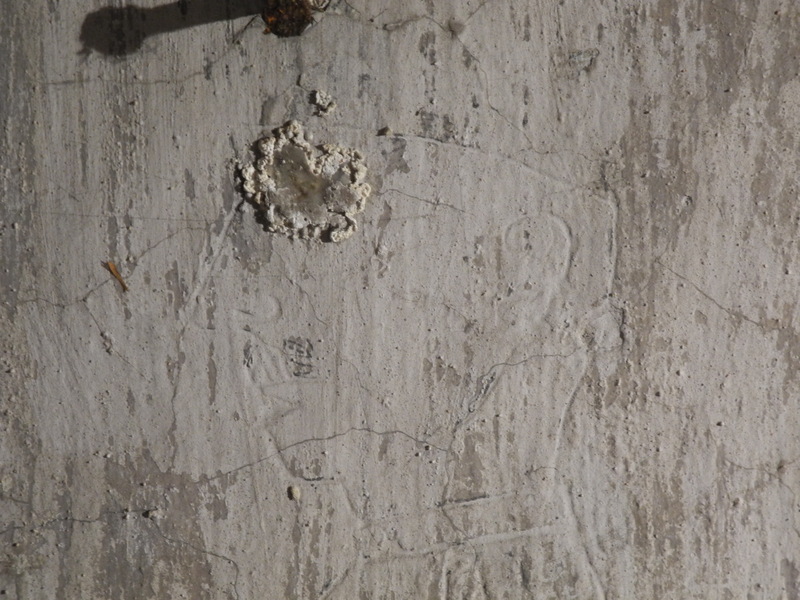 There were only a tiny number of additions from later periods, unconnected to ex-prisoners marking their territory! In comparison, on the ground floor one has to pick one’s way through the numerous large graffiti of very recent vintage in order to locate the earlier material. The further down the corridor I have progressed the less the number and scale of more recent graffiti intrusions I have had to peer past but I have increasingly asked myself how should these more recent pieces of graffiti be treated? Are they really intrusions – to be ignored and looked past like an unnecessary fence blocking a picturesque view – or are they evidence of continuing, and even referencing, the tradition started by the prisoners prior to closure? 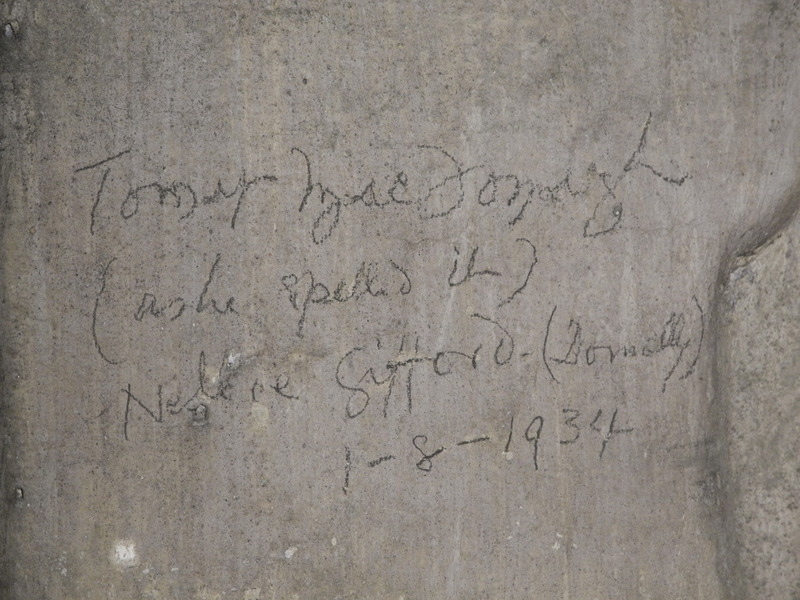 Of course the definition of graffiti as a ‘modern intrusion’ is a moving moment – the addition of graffiti by those who had previously been imprisoned in the 1930s is greeted with interest and recorded with the same care as the original graffiti. One can justify this by arguing that such additions continue the relationship with the site by past occupants, they indicate a continued connection to place and often reveal the impact of the intervening period on politics and ideals (not always in positive ways). For example, the attempts to sabotage or eradicate the name ‘DeValera’, which was written many times originally by those who emphasized the steadfastness of their ‘leader’ while imprisoned, can be interpreted as a disenchantment with his more conciliatory and middle-of-the-road politics once he actually gained high political position. But additions by those unconnected to the prison, or in decades long past past prisoners were still alive, are viewed as a nuisance (even by me!). On the ground floor there is a proliferation of graffiti that is dated from the 2000s (up to 2007), which is characterised by the scale (often very large), form (predominantly following: name, location, year of visit), location (mostly in well lit parts of the middle of the room), type (mainly engraved through the initial layers of plaster with a ?screwdriver) and sheer disregard for the extant graffiti on the wall. When first confronted with this type of graffiti I recorded it in the round – large parts of the wall were photographed as overviews with close-ups only of the earlier graffiti that I could locate (even if partially) under these later, blunt incisions. But increasingly I started to notice some interesting characteristics of these ‘modern intrusions’. The number of people from Northern Ireland who had added their names and location (often to quite specific locations – as above) was unexpected, the number of foreign locations that were articulating some political communality (especially true of those from the Basque country). The number of paramilitary organisations that appeared – ‘ETA’ ‘IRA’ being the most common – was also notable. There was the multiple use and contestation of swastikas in at least one cell. It became increasingly hard to dismiss all these graffiti as ‘modern intrusions’ that sullied the cell walls, were unconnected to the place and were the work of cretins. Rather there was a need – if reluctantly – to consider how they linked to the biography of the prison. How they were – at times – attempting to articulate their link to place and time specific to Kilmainham Gaol. How they were displaying their political allegiances in a building that they felt was in some way sympathetic to these ideas. Equally, how they were contesting the status, meaning and importance of the site as a nationalist icon. 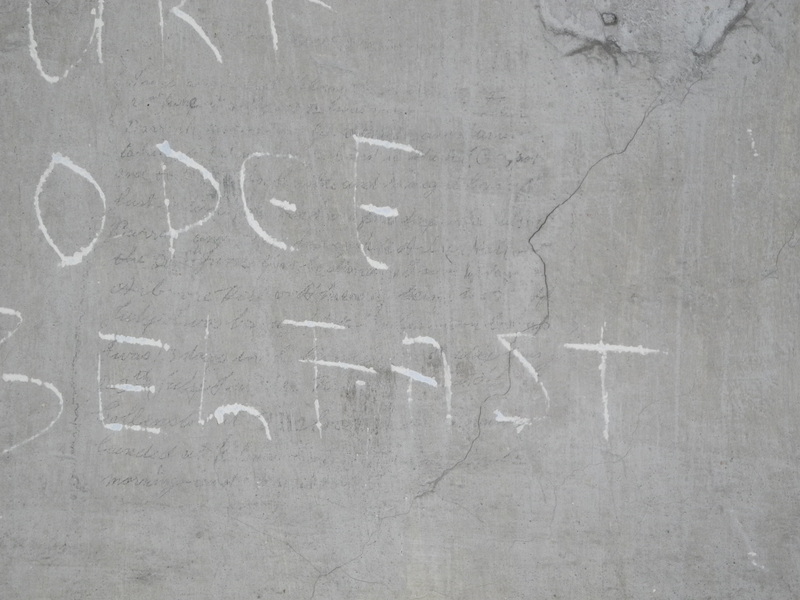 There are a number of ‘UVF’ graffito that appear on the walls (a Northern Irish loyalist paramilitary organisation), which are puzzling. Whilst one can question why a loyalist from Ulster would visit such an established icon of Irish nationalism perhaps they were attempting to question the consensus that links Irish – nationalist – Southern – catholic – gaelic at Kilmainham Gaol by presenting their interpretation of the Northern – protestant – British political prisoners who initially where housed in this prison (and indeed this corridor) in 1798? My extrapolation of small pieces of recent graffiti may be one step too far – and I in no way condone the blunt scratchings on walls of an established historic site – but one must question if there is a need to include their voice in the narratives of the prison? Kilmainham Gaol is not just an historic prison, it is a continuing, active site of dark heritage. It attracts huge numbers of tourists, many international, and their reasons for attendance are not all the same, just as their impacts on the site are not all imperceptible. The prison is not an inert or dead site. It continues to ‘house’ people, albeit it for the duration of a guided tour and as such their interactions with the site can leave material traces. 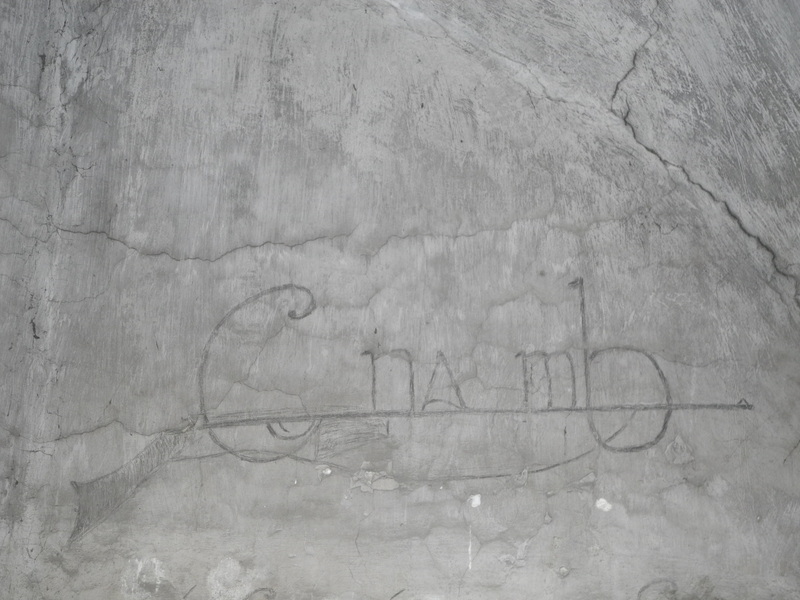 Although this later graffiti can not often be compared with the variety and richness of the earlier examples – it is not as thought-provoking, skilled or as varied as the earlier collections – it would be wrong to completely dismiss it. In a graffiti recording project such as this ‘modern intrusions’ are as materially present as historic precedents (if not more so!) and as such they are part of its story and should be included (to what degree, it is yet to be determined).